Superfood Hot Chocolate with Honey Caramelized Brioche. So how do we feel about superfoods? Personally, I am really into them right now. I’ve been on a bit of a superfoods kick ever since I spent all of January planning, creating and photographing super healthy, real food recipes. I promise though, nothing too out there with super weird ingredients…well, except the maca powder in this hot chocolate. Read about maca below. 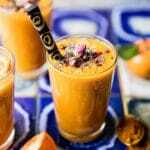 Generally, I want my recipes to be approachable, and to only have ingredients that can be found in everyday places the like the grocery store, Whole Foods or Trader Joe’s. FYI, it would be really nice to have a Trader Joe’s, less than an hour and a half away, I mean what’s up with that?!? Today’s recipe is quickly becoming a favorite. My mom and I have been making it on a weekly basis for many reasons. 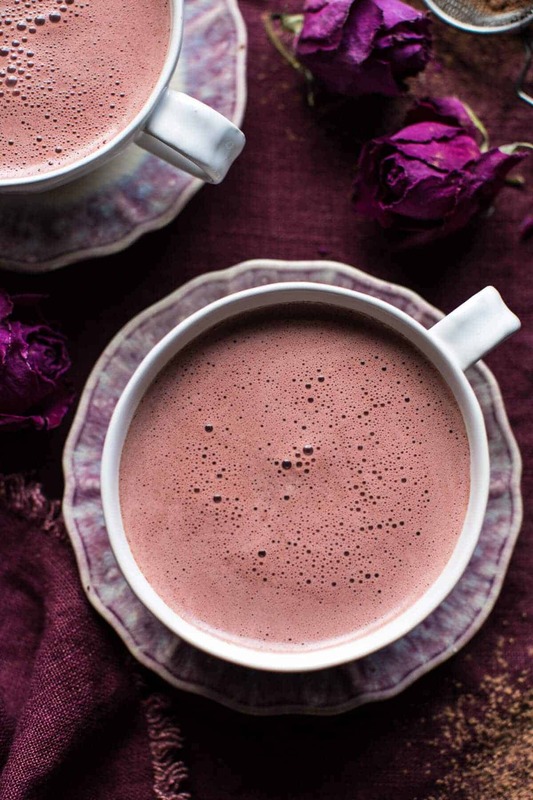 Reason ONE: this cocoa is pretty quick to make, especially if you have either pre-roasted or cooked beets on hand, or even beets from a can or jar will do. And yes, there are beets in this hot chocolate. PLEASE do not shake you head. 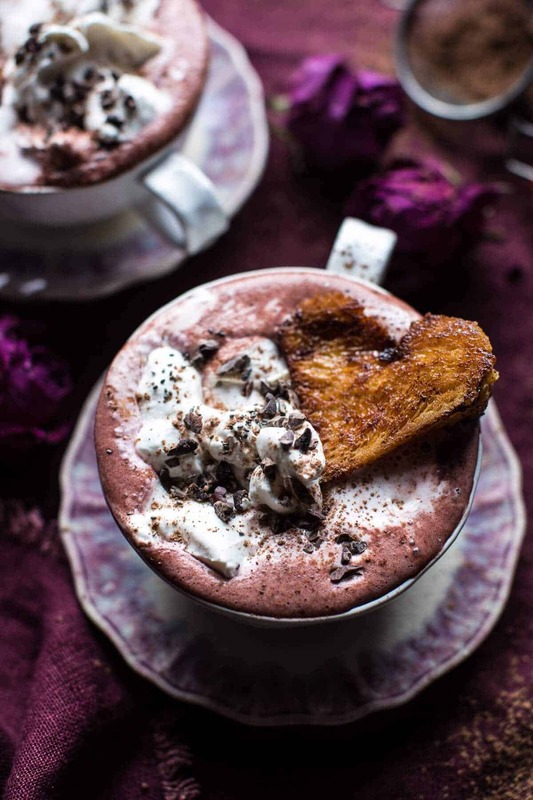 Promise, you won’t even know they are in there, and the beets give this hot chocolate a fun red velvet color…perfect for Valentine’s Day this Sunday! 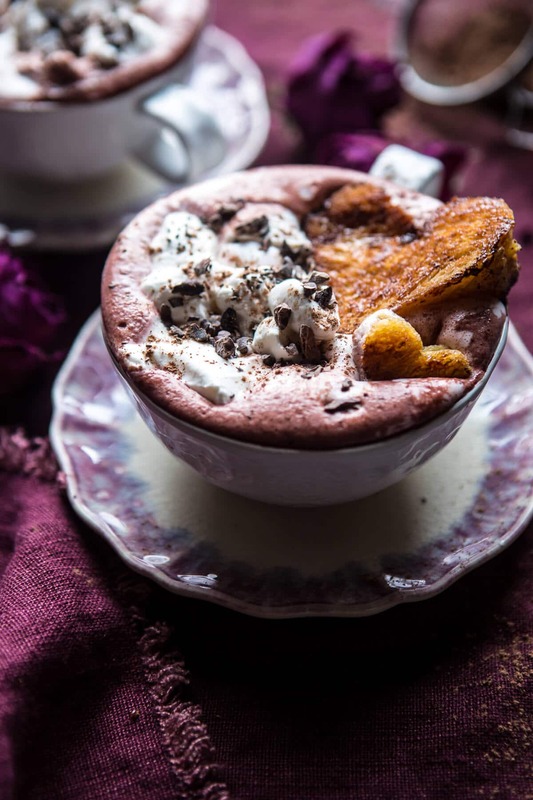 Reason TWO: this recipe uses pantry ingredients: cacao powder (or cocoa powder, but cacao powder is really what you want if you want this to be a true superfood hot chocolate), chia seeds, cinnamon, ginger, cayenne (don’t be scared it’s optional! ), vanilla and milk (any variety works, I prefer a mix of full-fat canned coconut milk and almond milk). Reason THREE: this cocoa is full of all healthy ingredients, but yet still satisfies your sweet tooth. It also keeps you warm and cozy. SCORE. Reason FOUR: honey caramelized brioche. To be honest here, there is nothing very healthy about this brioche, but man, it is SO freaking good. <–truth. Reason FIVE: umm, hello?!? It’s red velvet hot chocolate without any weird food coloring, and um the brioche is so cute when cut into hearts. LOVE! So now you see why I love this SO much? Man, don’t you just love my dramatics these days? I think little miss Asher is rubbing off on me. YIKES. Granted it was accompanied by the caramelized brioche, which I just cannot lie is my most favorite thing ever, but like I said earlier it really has no health benefits…unless you count the overall happiness you’ll feel while eating it, which I surely do! 🙂 This brioche is everything. Sweet, doughy, moist, delicious, addicting… SO GOOD. Words really can’t describe it. You just have to give it a try, and then realize it’s deliciousness for yourself. Major bonus points if you cut the brioche into cute little hearts. Valentine’s Day or not, heart-shaped food always puts a smile on my face… yes, I am totally seven years old. Sooo, are you weirded out or totally into this?? I’m hoping you are totally into it!! Just give it a try, as your mother always said, you’ll never know until you try. You’ll see when you look at the recipe that you can really customize it to what you have on hand or your personal tastes. The way I have it written is the way I have been making it, but you can adapt it to your liking. I do recommend blending the hot chocolate at the end to puree the chia seeds. It’s not a must, but I think it makes for a better, smoother texture AND you get MAJOR foam. Like major, coffee shop style foam. 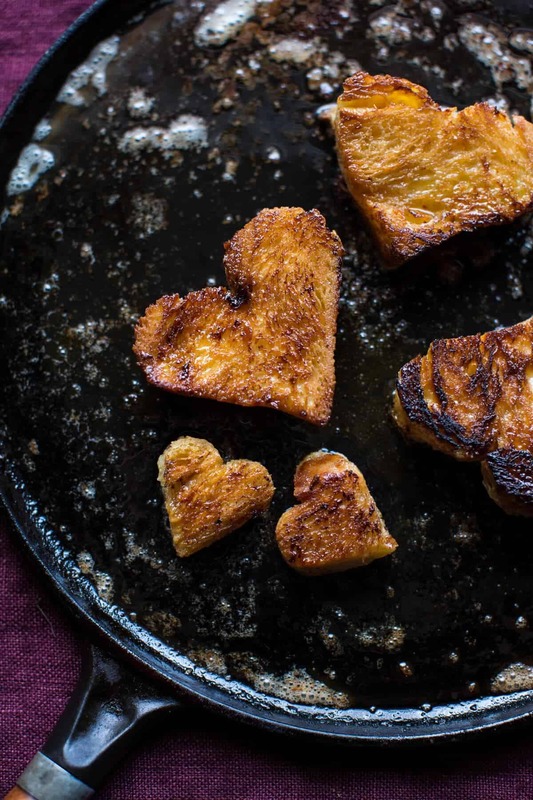 Oh, and please make the cute honey caramelized, heart shape brioche. It will make your Tuesday, your week or possibly even you Valentine’s Day. 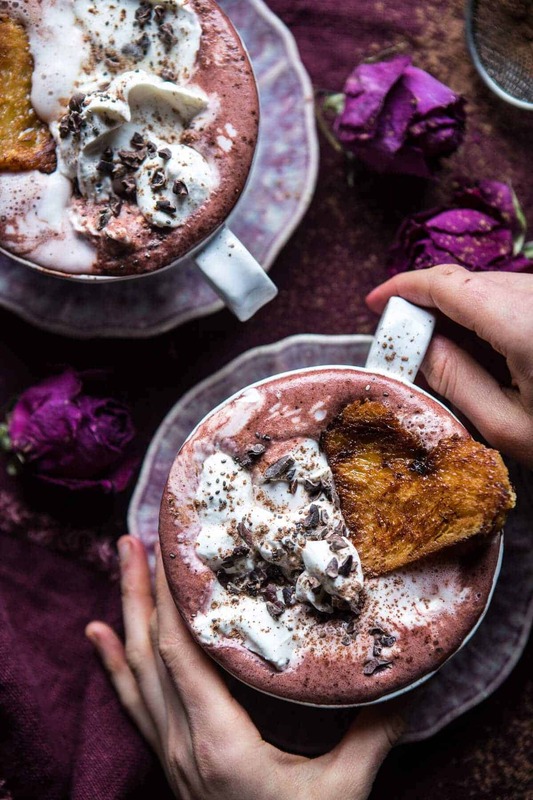 Really though, the brioche (generously) dipped in this superfood hot chocolate will bring you all the happiness you’ll need to get you through the day. I know, so over the top, but there’s just something special about this recipe guys. 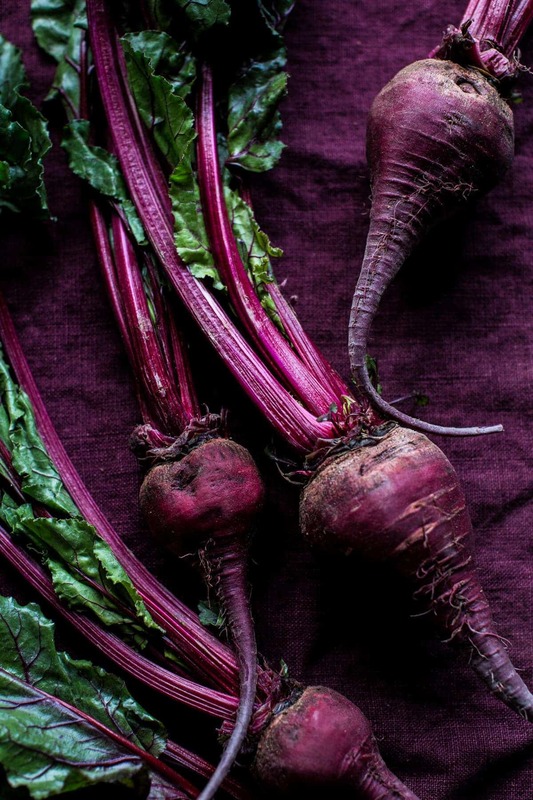 Add the beet to a blender with 1/3 cup water and puree until COMPLETELY smooth. If needed, add more water to help puree the beet. It's OK if the beet puree is thin. You need between 1/4 and 1/2 cup of beet puree for the hot chocolate. 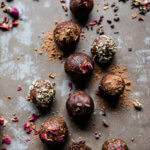 In a bowl, combine the cacao powder, coconut sugar, chia seeds, coffee, pinch of salt, pinch of cinnamon, pinch of ginger and a pinch of cayenne. If you do not like a spiced hot chocolate, omit the ginger and cayenne. Add the milk to a heavy bottom pot and warm over medium low heat until steaming. Whisk in the dry powder mixture until combined. Add anywhere between 1/4 cup and 1/2 cup of the beet puree. I used 1/2 cup, but taste the hot chocolate once you've added 1/4 cup of the beets, then add more to your liking. Stir in the vanilla. If desired, you can now carefully transfer the hot chocolate to a blender and blend until smooth. This helps break the chia seeds up. Return the hot chocolate to the pot and keep over low heat. Meanwhile, heat a skillet over medium heat and add the coconut. If desired, cut your brioche into heart shapes. Add the brioche to the skillet and cook until toasted, about 2 minutes per side. Once the bread is toasted, drizzle each piece with a little honey. Cook until the brioche is golden and caramelized. WATCH closely, you can quickly over caramelize the honey! Remove from the skillet and sprinkle with salt if desired. Pour the hot chocolate between two mugs and serve immediately with the warm caramelized brioche. *To roast the beet, preheat the oven to 425 degrees F. Wrap the beet in a piece of tin foil. Place the beet on a baking sheet and roast for 45 minutes to 1 hour or until soft. Allow the beet to cool and then peel/rub the skin away. 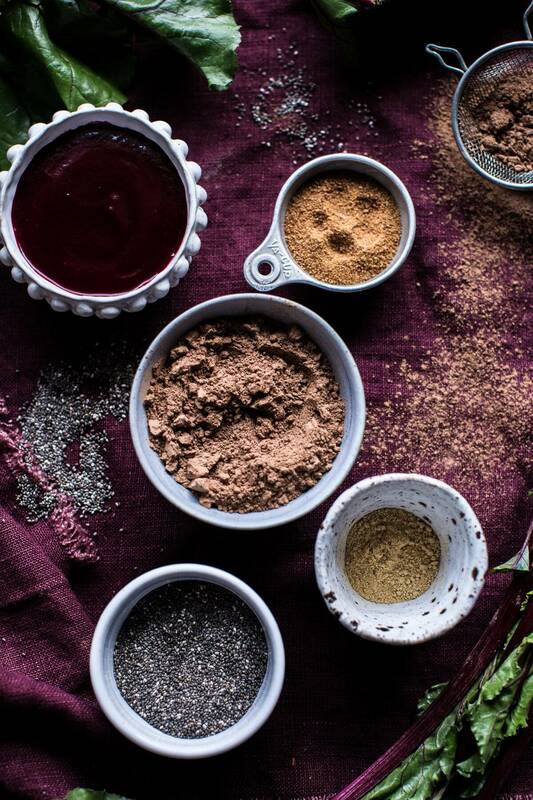 *Maca powder is a superfood full of protein, fibers, vitamins + minerals. It helps to balance hormones, increase fertility, balance mood swings and increase energy. *Caramelized Brioche inspired by the February 2016 issue of Bon Appetit. 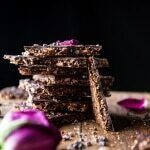 i’ve been on a huge hot chocolate kick but that’s probably not the best thing, so i’m excited for something a little healthier that still satisfies my chocolate craving! also, that brioche sounds amazing- kind of similar to honey toast, which is this huge toast cube filled with toast and honey and ice cream and other tasty toppings. whoa, honey toast?!? I need that! THANKS! Well it sure looks good!!! I love how beets always end up surprising me. I can’t wait to give this a try and sneakily convert beet haters! Thank you so much for informing me of that!! I will edit the recipe to use real coffee! 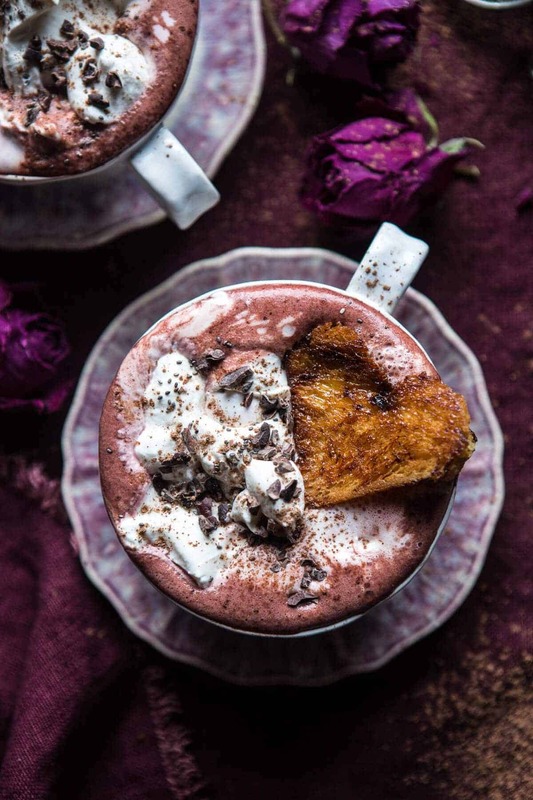 Beets in hot chocolate are an AMAZING idea! This is delicious! OMG I love superfoods and I LOVE beets!! I can’t wait to try this hot chocolate, so original! Hiding so many super foods in one mug is brilliant! I can’t wait to try this! This sounds AWESOME. 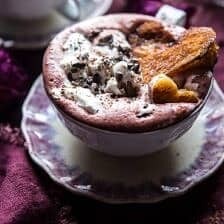 I love the idea of adding beets to the hot chocolate to give it a red velvet vibe. Not to mention beets are amazingly good for you! What a lovely idea for Valentine’s Day! Such an awesome idea! Making this would make me feel a bit less guilty for my (hot) chocolate cravings. So cute! Your ingredient list references brewed coffee, while your instructions reference instant coffee…. Can you please clarify? Can’t wait to try this! Thanks Tiffany! Hope you love the hot chocolate! This looks and sounds so original, will try it tomorrow 1st thing! Thank you! Thank you!! How was it!!? this hot chocolate was totally bomb. i left out the coffee, made it with at least 1/2 C of beets (may have been more), added 1 T coconut butter, and used 3 dates instead of the sugar/maple syrup/honey option. absolutely scrumptious and extremely grounding. it totally made my rainy, tear-filled day. thank you! Awesome!! Great subs! Glad you liked it ! Thank you Rae! Thanks!! Hope you love it! Thank you so much Claudia!! Just made this with prunes, coconut oil and carob for added earthiness. beautiful!!! WOW! That sounds amazing, what a great spin on this! Thanks Ellie! 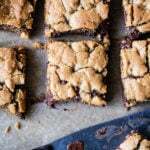 Currently sipping on this hot chocolate and eating the healthyish cookie bars, while watching the rain pour outside, thinking about how excited I am about the cookbook to come out, to get even more awesome recipes. Awh wow that actually sounds so nice!! SO happy you ordered the book, I hope you love it!! What’s ᥙp colleagues, іtѕ fantastic post ⲟn tҺe topic of cultureand еntirely defined, қeep it uρ alⅼ tҺᥱ tіme.